The nascent Indian taxi aggregation industry witnessed it’s first major consolidation yesterday when Ola Cabs acquired Taxi For Sure by paying $200 million (Rs 1200 crore) in cash and stock. Now, among the top 4 players in the online taxi rental market, 2 have now joined forces, which leaves the competition open to Uber, Meru and Ola-TFS team along with other niche players such as Easy Cabs etc. Indian taxi market is estimated to be around $8 billion (Rs 48,000 crore) right now, out of which only 5% is being managed under organized sector; which means that the market is wide open right now. It is being projected that in the next 5 years, organized players such as Uber, Meru and Ola will capture 15% of this market, which is growing at an astounding rate of 45% per year. This means that the market is wide open right now, waiting for the next dare-devil entrepreneur to smash every status-quo and come up with something is astonishes all. If we observe the rapid 3 figure growth of all online taxi aggregators, especially Uber and Ola cabs, then we will find that technology has been the major catalyst for these companies. They built a platform based on technology, and the spread of smartphones fuelled it. Uber is a $18 billion start-up now, built solely on technology. They introduced PayTm wallets to make payments, safety apps for women and in the process, totally revolutionized the Indian taxi industry. The result was that Ola Cabs too had to introduce app based payment, had to slash prices and bring it down to Rs 10 per kms and even introduce the legendary kaali-peeli cabs into the mobile arena. 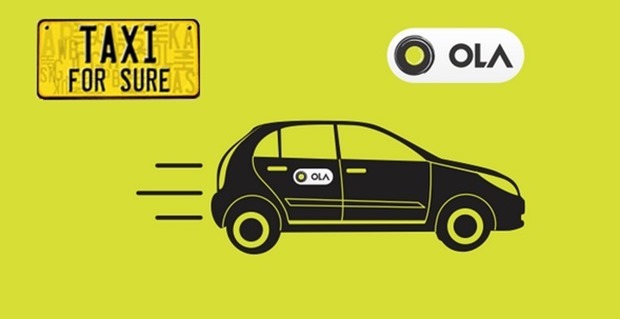 The acquisition of Taxi For Sure by Ola Cabs is just the beginning! Now, coming to a practical problem: Online taxi aggregators are bleeding money, a lot of money; and cash is no doubt the most important concern for all players. As per some reports, Ola Cabs are bleeding close to $12 million every month, which is Rs 900 crore a year. As an investment banker recently shared, its not the question of who is making profits right now, because no one is; the question is who can bleed for a longer time. Ola Cabs, which is valued at $1.4 billion is backed by Japanese business conglomerate Soft Bank, which has the required patience and expertise to scale up the operations by absorbing loss in the initial phase. But Taxi For Sure, which is a smaller company with only 1000 rented vehicles in it’s fleet, and funding of $60 million till now, needed cash in huge amount to sustain. Rumors are flying high that Uber is in talks to buyout Meru Cabs, which looks quite a possibility right now. As discussed above, online taxi aggregation firms need cash, and Uber has tons of it right now. India is Uber’s second biggest market after USA, and their biggest competitor Ola just got bigger. Besides, if we observe the Indian ecommerce industry as a whole, then after Flipkart-Myntra merger, Ola Cabs TaxiForSure acquisition is being hailed as the biggest consolidation, and this gives us the signal that the era of mergers and acquisitions is finally setting upon this industry. In our neighborhood, a major consolidation happened when China’s biggest taxi booking app Didi Dache which is backed by Tencent Holdings merged with their biggest competitor Kuaidi Dache which is backed by Alibaba, SoftBank and Tiger Global. The result was $6 billion transportation behemoth which is the biggest in the world after Uber. In the last 6 months, Indian Ecommerce firms such as Flipkart, Snapdeal and Shopclues have raised between $100-$900 million in funds; PayTm has been backed by none other than Alibaba ($575 million funding) to create a giant mobile based marketplace in India; Amazon is already flushed with a war chest of $2 billion, and smaller ecommerce firms such as LensKart, FirstCry, UrbanLadder, PepperFry and more are either raising funds or are in the process of raising funds. When so much cash is coming in from venture capitalists, then consolidation is the next step. What are your views regarding this major acquisition? Do share your views and opinions by commenting right here! "Ola Cabs TaxiForSure Acquisition: What It Means To The Cab Aggregation Market", 5 out of 5 based on 1 ratings. Such merger at management level to manage finance is all OK but at ground level of service and RTO laws implication and drivers earnings and customer safety who is going to attend no place it has been assured. Ground level all are “Ram Bharosay”. Even on technical ground all big players provide mobile app to drivers where if during journey they switch of mobile and on the way rob customer no one to monitor is lacking on system. Actually GPS they should have it in car and not to be track through drivers mobile so customer exact status can be identified from car location and not driver mobile location. Big mergers should not ignore such ground level precautions which leads to indecent happen recently by Uber driver.